Sebae Anemone/Health/Systems - 06/07/2006 Hi there, I'd just like to start by saying your site is very useful, and has certainly saved me from inadvertently given LFS misinformation. I have a question about what I believe may be an ailing Sebae Anemone. I have a ten gallon nano with about 12lbs of live rock and 20lbs of live sand, Nano-skimmer, carbon/bio filtration, and I change the water 10% every other week. I monitor the levels very closely, but only with test strips. According to the strips the levels are all optimal. It's a fairly well established (4 months) system with several blue hermit crabs and turbo snails, 2 Ocellaris clowns, and a Royal Gramma. I got the Sebae about four days ago, and it immediately moved to a part of the tank with pretty constant but light water flow, and dug its foot in to the sand. 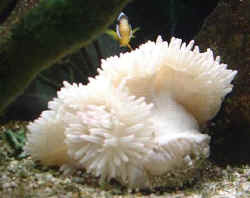 Since I got it I have realized (thanks to your site) that the white coloration of the anemone is actually a sign of bleaching (doh!). But at the LFS it was all inflated and actually had a clarkii nesting in it. I went on the fact that the guy at the store said an Ocellaris would probably like a Sebae. 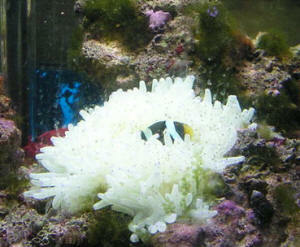 I since also found out that there are probably more suitable choices of anemone. <Believe the LFS gave you more misinformation. Your tank is too small just for the fish you have in there.> (lesson learned. Always do research) however, I put the Sebae in. I invested in some invert supplements for the water to give the thing better chances. I have noticed over the last few days that the anemone has a habit of inflating and deflating during the course of the day. It will plume out for about an hour to two hours, then deflate for the same time. I didn't really think much of this at first because I heard they do this to get used to new water. However, I got up today, and its lying sideways on the sand, deflated, with its foot exposed. There's no sign of it breaking up at all, the foot looks like its not torn or anything like that. There was a problem in the oral area, it looked almost like it had hemorrhoids in its mouth. Today that's gone, and the oral disk is rather smooth. Although on its side the disk is opening and closing slowly, and the foot does seem to me moving somewhat (but extremely slowly. Is this thing doing its swan song? Or is there a way I can save it? <I'd see if you can take it back to the store, won't live in your tank.> I couldn't really find this specific situation in any of the articles. <You probably won't. The situation shouldn't exist.> I appreciate your help, and apologize for writing you a book here. Thanks in advance, <Chris, you should have researched the Sebae before buying. You have nowhere near the requirements for keeping one alive. You do not mention lighting, so I'm assuming you do not meet the needs there either. Enough light for this anemone would probably heat up that 10 gallon to 100 degrees. 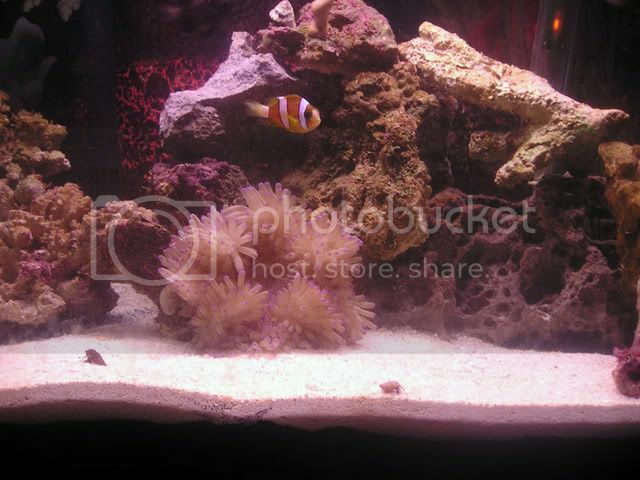 I will post a link for you, too much info on keeping anemones to pen here. Do read along with related topics above and you will see how far off you are. 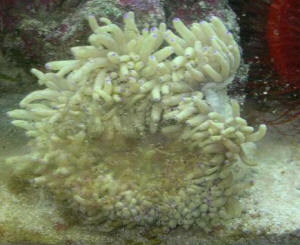 http://www.wetwebmedia.com/marine/inverts/cnidaria/anthozoa/anemones.htm James (Salty Dog)> Chris H.